When Vee is picked to be a player in NERVE, an anonymous game of dares broadcast live online, she discovers that the game knows her. They tempt her with prizes taken from her ThisIsMe page and team her up with the perfect boy, sizzling-hot Ian. At first it’s exhilarating–Vee and Ian’s fans cheer them on to riskier dares with higher stakes. But the game takes a twisted turn when they’re directed to a secret location with five other players for the Grand Prize round. Suddenly they’re playing all or nothing, with their lives on the line. Just how far will Vee go before she loses NERVE. Which Book Should You Check Out Based On Your Favorite Summer Jam? Watch Jeanne Ryan Explain NERVE in 30 Seconds! Have 30 seconds to discover a new favorite book? 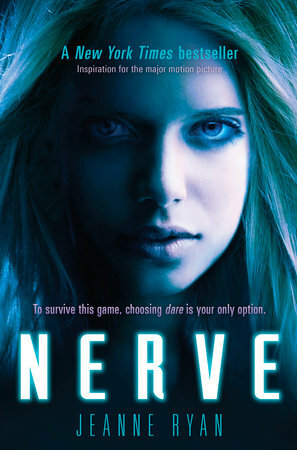 Watch author Jeanne Ryan pitch Nerve! Ready to read? Get your copy of Nerve!